Around the wider world of golf: Not a whole lot going on this week. Thaworn Wiratchant won the King’s Cup on the Asian Tour, and Sakura Yokomine won the ElleAir Ladies Open on the JLPGA (the Constructivist has details). On occasion I make a prediction and get it right. For example, back in January 2011 I said Luke Donald was in position to have a breakout year and predicted at least one big win -- roughly two months before Donald won the 2011 WGC-Accenture Match Play and went on to win the money title, PGA Tour Player of the Year, and become #1 on the OWGR. Then there was the June 2011 post where I said that a new kid named Victor Dubuisson bore watching, that "once he acclimates a bit more to Tour life, he could become an outstanding player." A couple of years later he won the 2013 Turkish Airlines Open... and he was off to the races. But predicting a winner at a specific event isn't one of my strong suits. In fact, I've remarked more than once about the Ruthless Golf Curse affecting my picks. (You may even remember this post apologizing to Jiyai Shin and Corey Pavin for jinxing them.) 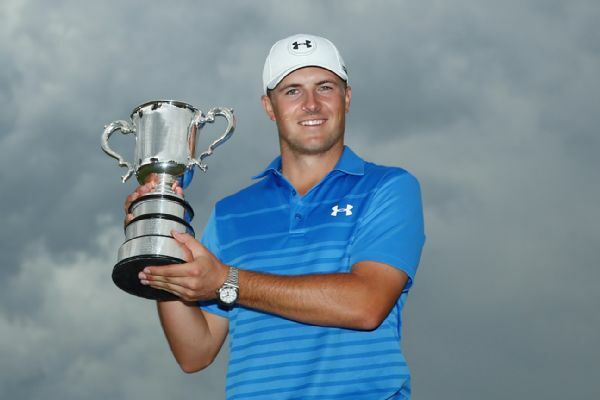 So you'll understand that this victory by Jordan Spieth is particularly satisfying for me! And then he obliterated the field with a bogey-free 8-under 63 in the final round, posting a total of -13 to win by 6 full shots. To make it even better, he did it on a tricky sandbelt course in swirling winds. An echo of Spieth’s rolling thunder! Which pushed him up over Down Under. The photo came from this ESPN article. Thanks for the update, IceCat. I should have paid more attention to the date on the post!